Two TWD brekkie posts in a row— it’s a good month! This week we’re cooking up Dorie’s Sweet Potato Biscuits, thanks to Erin of Prudence Pennywise. These biscuits have a bit of brown sugar in them, but I wouldn’t really call them sweet (although maybe that’s because I didn’t use the canned sweet potatoes in syrup that the recipe calls for…I used a unsweetened organic mashed purée instead). They’re just as tasty with turkey bacon and eggs as they are slathered with maple butter. Trust me on the bacon and egg thing…this little sandwich was one of the tastiest breakfasts I’ve made in awhile…if you are a fellow HP addict, don’t forget to bring the bottle to the table! For the recipe, see Baking: From My Home to Yours by Dorie Greenspan, or read Prudence Pennywise. Don’t forget to check out the TWD Blogroll! That breakfast sandwich is calling my name. It looks wonderful as does your lovely biscuit. Glad these were a hit. I’m so impressed with how you served this! I never thought to put with an egg and bacon. Weren’t these delicious? Now that’s a breakfast! Lovely idea. These look incredible. I love that you used them for a breakfast sandwich. You are so clever! Looks like a wicked good breakfast right there. Love it! So good! But I can’t claim to be that clever, just a good copycat…I was poking around online last week for bisciut-making tips and I saw lots of yummy sandwiches out there. That pic is making me drool! Okay, I can do that! I like eggs. Wow Steph that really says it all and looks so beautiful. Great photo. ooh, can I have one??!! That looks so delicious. Can I have a slice of cheddar cheese on mine? I could do with one of those right now. Yum! That looks awesome. Unfortunately mine came out like hockey pucks. Perhaps I should try again. What a great idea, the flavors together sound great! Love the photo…and thanks for all the creative ideas over here. I aspire. ooh! love that you made this into a sandwich! look delicious! What a great variation! These look great – and your photos are spectacular! I also LOVE and have Southern Cakes…. GREAT posts today – can’t wait to try that coffee cake! Nicely done Steph! yum, that looks delicious – quite a different take on what I imagined biscuits to be – I thought they were more scone like, but that looks quite savoury. yum! I thought of making a breakfast sandwich from them too but never did. Yours look wonderful! The biscuit looks really good with the round egg! Do you have one of the metal round things (not sure the name)? 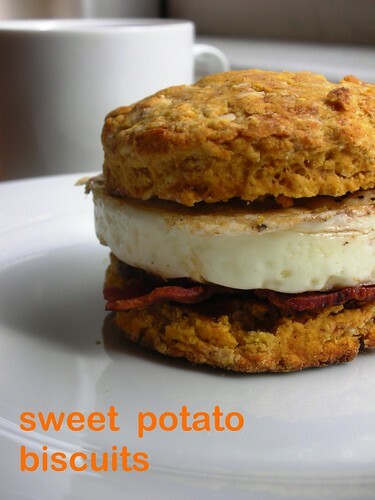 Seems like a nice kitchen gadget to have on hand, just in case there’s ever more sweet potato biscuits. Yes, I have a set of egg rings. I really almost never use them, but I wanted that neat look here. Oh wow! I wish I would have thought to make these into a breakfast sandwich. I will have to whip them up again. They look amazing! What a great idea, that sandwich looks awesome! I love how you can serve these biscuits for breakfast or dinner. WOW ! What a sanwhich !! I’d love one for lunch !!! I thought of the sandwich but not the egg. Yum! Taking pictures of these little biscuits was a challenge but yours turned out very nicely. Oh, I’m in love with that sandwich!! What a dream breakfast. Delicious! I’d be delighted if someone served me this for breakfast. That is my kind of breakfast sandwich. WOW!! !